I’ve come across quite a few interesting or novel pens. I’ve tested out most pens I can get my hands on and have determined my taste accordingly. But a pen caught my eye recently with a gimmick I’d never seen before. 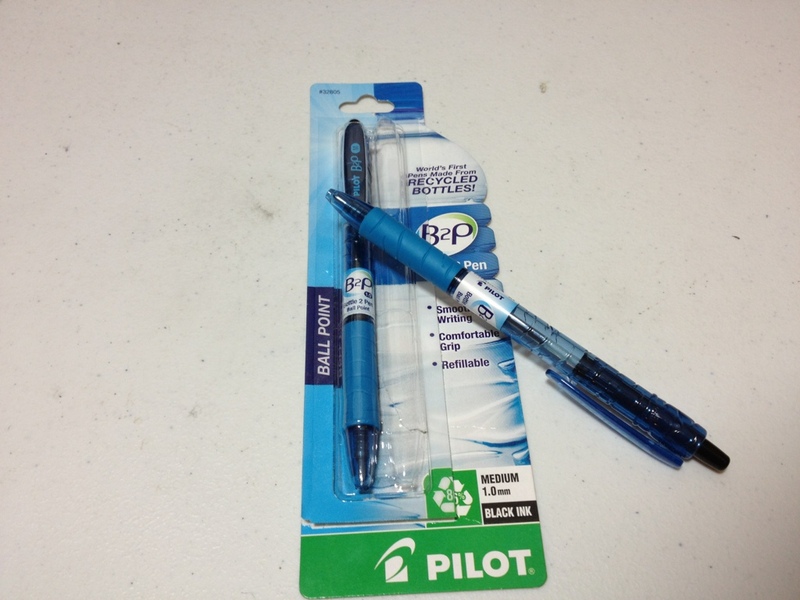 It was a Pilot B2P pen, made out of recycled bottles. I’d seen pencils made out of recycled denim, but never a recycled pen. I don’t usually pick up Pilot pens but I decided to give this one a try, if only for the novelty. I’ll start with the writing performance, because on this pen that’s less interesting. It’s a ballpoint, and for a ballpoint it writes amazingly smooth, even smoother than most Gel pens I’ve used. The ink is black and fairly dark. The line is thin, well, at least thinner than most ballpoints. It usually writes on the first go with no skipping, a problem I usually have with Gel pens. It’s fairly impressive, though I think it may run out of ink rather quickly. Onto the body, which is a fairly pleasing blue color. It’s got a fairly useless grippy-grip near the tip and a mid-way between sturdy and flimsy pocket clip on the back. The blue is dark but transparent on the back, mimicking a bottle, and to further the effect it has ridges and troughs to look and feel like a crumpled up bottle, making it feel quite nice in the hand in my opinion. 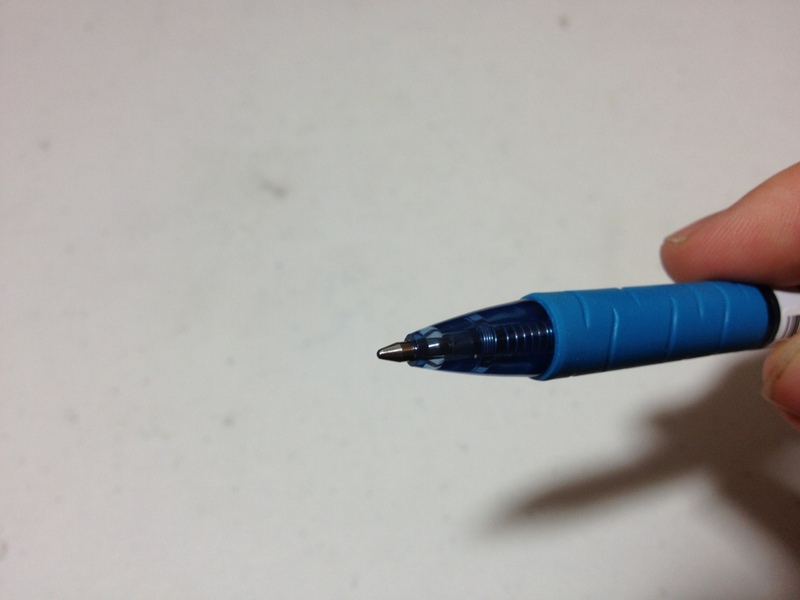 There is an easily worn off label around the center of the pen that contains all useful information, though the more pertinent information is also on the clip. The retractable mechanism works quite well and doesn’t seem break-prone, it’s nice and solid (though if they hadn’t perfected this tech by now they never would). It also disassembles easily and well into parts for replacement and refilling, though I doubt you’ll ever do either of those. So yes, it’s a nice ballpoint, not the nicest ballpoint, but a nice one. For the price it’s good and novel. And the feel is quite nice. 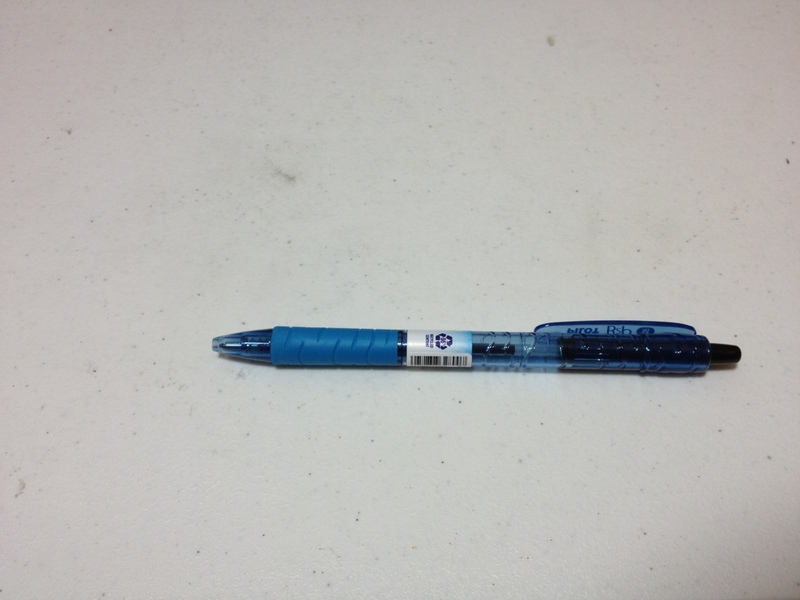 Its uses are that of all ball pens and this one doesn’t stand out terribly. But it is good, and a very interesting idea. And it’s a better conversation starter than the standard click-y ballpoint.